On the cadastral map of the municipality of Nieuwpoort, put up in the year 1827, the buildings Buitenhaven 8 (barn) and 10 (private house) are already mentioned. 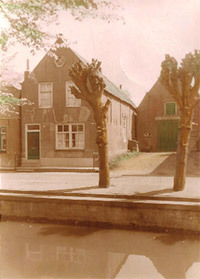 Since 1968 the location Buitenhaven 10 is a protected national monument with the description: property under gable roof with a plastered on the front gable (XIX A). It was once a little city farmhouse with a stand at the back for ca. 6 cows. In summer these were dedicated along the Singel of Nieuwpoort. Behind the house stood a big vegetable garden entirely to the back path (now Schippersweg). Now it’s an ornamental garden with terrace and ramp. Next to it is the barn, who once served as stable owned by the Café De Dam. Here the horses with cars were driven inward while the coachman stayed in the café or went to church. There was a well for the horses to drink. The beams are original and were supposedly ships ‘ masts. The upper floor was used as storage for hay and straw. The building was later used as small factory and storage for building materials. In 1996, after a major conversion there is a charming Bed and Breakfast realized, with lots of authentic details. Then Bed & Breakfast De Uitspanning was started.